Rep. Lynda Schlegel Culver (R-Northumberland/Snyder) hosted her Fall Senior Forum on Oct. 9 at the Lower Northumberland County Senior Action Center. More than 40 area residents attended to hear Specialist Jerry Mitchell from the Pennsylvania Office of Attorney General detail the “Senior Crime Prevention University” presentation which addressed identity fraud, living wills, scams and elder abuse. 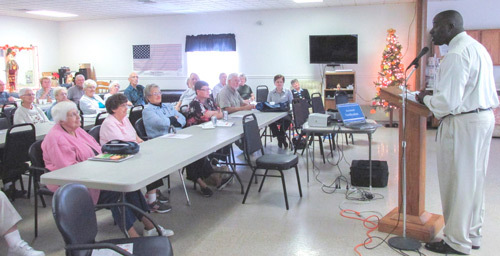 SUNBURY – More than 40 area residents attended Rep. Lynda Schlegel Culver’s (R-Northumberland/Snyder) annual Fall Senior Forum, held on Oct. 9, at the Lower Northumberland County Senior Action Center in Herndon. Culver invited Specialist Jerry Mitchell from the Pennsylvania Office of Attorney General to detail the “Senior Crime Prevention University” presentation, which addressed identity fraud, living wills, scams and elder abuse. Mitchell highlighted the following goals for the Senior Crime Prevention University: making seniors aware of common scams; helping them to avoid becoming victims; and encouraging them to alert officials when they have a concern. The Office of Attorney General offers a toll-free hotline for senior citizens at 1-800-623-2137. For more information about Culver’s Fall Senior Forum, or any state-related issue, please contact her district office in Sunbury by calling 570-286-5885. More information can be found at LyndaCulver.com or Facebook.com/RepCulver.